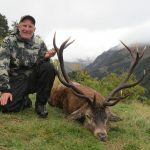 Lake Hawea Hunting Safaris has been offering New Zealand Hunting since 1993. 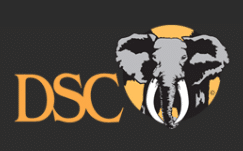 Our guiding service is based around Red stag hunting, Tahr hunting and Chamois hunting. 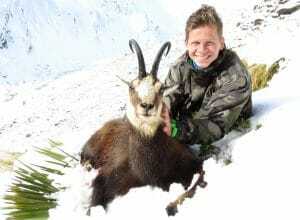 Lake Hawea Hunting Safaris offers hunting packages for these three main game animals. 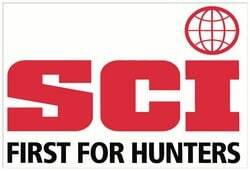 We also offer New Zealand hunting for further species – South Pacific Whitetail, Fallow, Sika, South Pacific Elk, Arapawa ram, Goat and Boar. 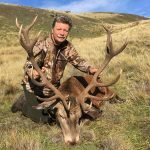 Choose from our New Zealand Hunting Packages or browse through our species offered and ask Chris to build a tailored New Zealand hunt for you. 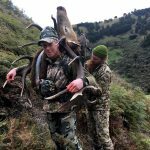 We are a family business specialising in accommodating and guiding small groups of 1 – 6 international hunters in the mountainous regions of Otago and South Westland, South Island, New Zealand. 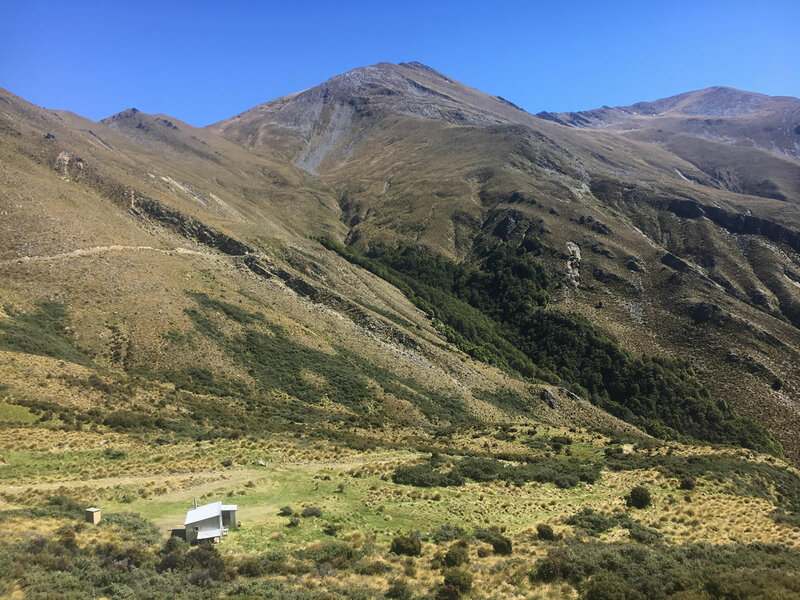 We offer New Zealand hunting on exclusive private properties from comfortable accommodation where non hunters are welcome, or for those who like to get out on the wild side we offer the best of New Zealand’s alpine wilderness hunting from basic tent camps. 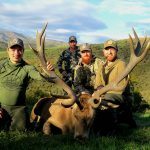 We don’t have a ‘railroad’ we want to force you down like some of the big guys, we would rather offer a New Zealand hunting package that suits you, or build a hunt that suits you. 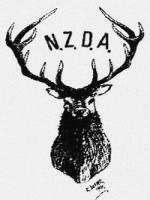 Lake Hawea Hunting Safaris…Quality trophies, quality experiences. 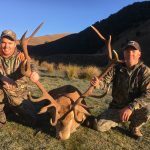 Chris McCarthy your New Zealand hunting outfitter and guide offers unrivalled knowledge and professionalism to help you achieve you’re hunting goals. 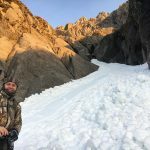 Chris’s can do attitude and tireless work ethic is backed up by more days in the New Zealand mountains than most and a wealth of international guiding experience ranging from Asiatic Buffalo to Dall Rams. I have spent a great week of hunting with Chris and Bill which I will always keep in good memory. 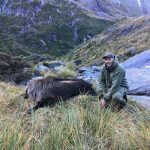 We managed to take a beautiful Tahr bull on day two (definitely a cracker…) of the hunt and after some rest and relaxation due to pouring rain we were successful on a nice Chamois buck (‘Gams’) on day five. Chris I was impressed by your level of professionalism and really enjoyed hunting with you, see you next time. 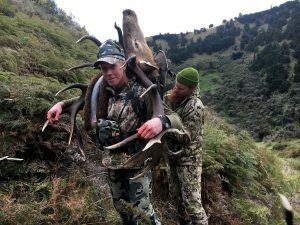 Thanks once again Chris and Bronwyn for a fantastic hunt in New Zealand’s South Island. Thanks also to Bill and Casey your 2018 guides. My family and I had a fantastic time and the kids got to see their first deer ever – during the roar. 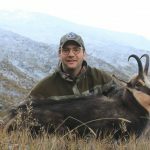 Chris is a professional, courteous and hard working outfitter that gives 100% for his clients to secure the best trophies possible. Will definitely be back. What a place, the original release point of the Highland Otago Red Deer, wait till you hear all the stags roaring. Another fantastic hunt guided by Chris, Bill and Casey, great people who work really well together. Finally at the end I shot a ripping head to take home, the curse is broken! Thank you very, very much everyone involved. Where to start!! We came on this hunt with no preconceived idea of what it would be like, but hoping to get the opportunity to shoot a quality Red stag. Well that happened but it was so much more than just shooting a stag each! The professionalism of Chris and Casey, the time and effort they put in made this a trip of a lifetime. Thanks so much Chris and Casey for making this an amazing trip. Sam + Michael, 2018, Australia. I don’t know who said that the ‘golden days’ of deer stalking were over, this hunt was as good as anyone could imagine. Chris you have made a lifetime dream come true and I am eternally grateful. Thank you Chris and Casey for making it happen. As always the food was excellent and the pig and fallow deer hunting was an added bonus. Well, what a week we had on the west coast with fantastic weather and plenty of animals spotted; we managed to take a beautiful bull on the 3rd day. The country we hunted was truly amazing; in camp we had a lot of laughs which made this hunt great. Bills cooking was eggscellent! I have had another awesome experience with Lake Hawea Hunting Safaris, thanks to Chris and Bronwyn for making me feel at home. After hunting with Chris in British Columbia in 2017 I knew I would be in good hands, we took a Mountain Goat with Archery tackle. We took a bull Tahr within 24hrs in the west coast wilderness, we then relocated for stag. Chris located a big stag on day four, Bill guided me in on the final stalk and I took the stag at 63 yards with my bow. Well done by all, a trip I will cherish. 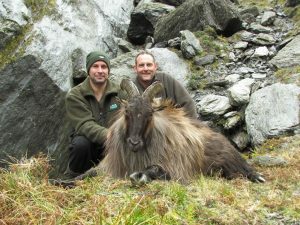 I took two beautiful Tahr trophies on a hunt that I will never forget. Chris has demonstrated to be a top professional with one sole objective, to meet in the best possible way all the clients needs. Possibly the best hunting guide I have ever hunted with. It was a delight to meet and enjoy the warm hospitality of the whole family. Thank you for all this, I shall return, it has been top. Just finished a 6 day Red stag hunt, had a wonderful time. 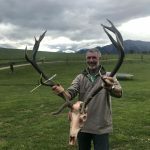 What a privilege to hunt these Highland Otago Stags from the original blood line release. Some magnificent animals, I was pleased to have killed a 15 pointer, an old stag with lots of character. I also enjoyed the ambience and relaxing surroundings in the cottage. Many thanks to Chris and Bill, I hope to be back in 2020. WOW! What a great hunt and even better people, (Casey’s breakfasts are great) well exceeded my expectations, managed to get a great stag, (once in a lifetime). Chris and Casey have made a long time dream come true. Thanks for a fantastic week, very relaxing, you have a great thing going, look forward to coming back. 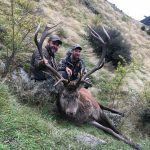 Book a New Zealand hunting package with Lake Hawea Hunting Safaris in the knowledge that we hold a Department of Conservation approved concession. 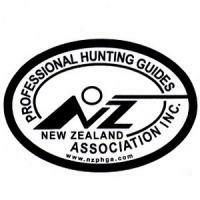 We are proud members of the New Zealand Professional Hunting Guides Association and associate members of the New Zealand Tourism Association. 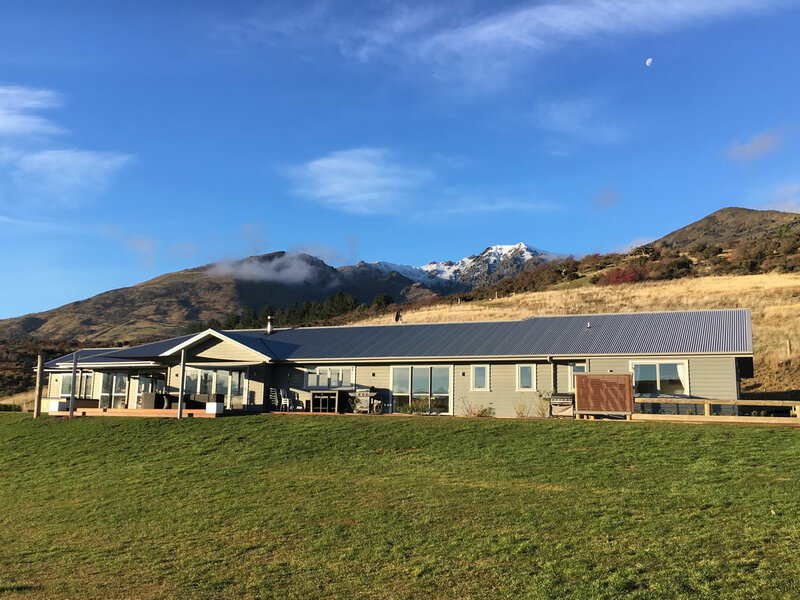 Lake Hawea Hunting Safaris’ objective is for everyone to have an enjoyable and successful New Zealand hunting experience as well as a safe and comfortable one.